Mrs Corlett was presented with her prize by Peter Reid, Island Director for Lloyds TSB, in a recent ceremony which took place at the Manx Museum. 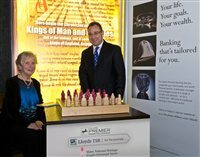 Six of the Lewis Chessmen are currently on display in the Forgotten Kingdom Exhibition at the Manx Museum towards which Lloyds TSB donated over £10,000. The Forgotten Kingdom tells the story of a time when the Isle of Man was the capital of a maritime kingdom extending from the Celtic Sea into the North Atlantic, when trade brought wealth, and wealth supported sophisticated art and the development of skilled craftsmanship. The kingdom encompassed the Outer Hebrides, Skye, the Inner Hebrides, Argyll and the Irish Sea. The seat of power was the Isle of Man and from this small island, the Kings of Man and the Isles ruled both the lands and the vital sea route that ran through the heart of what we now know as the British Isles. Lloyds TSB has been part of this history since 1765. Today, the organization maintains offices in major financial centres around the world, including the Isle of Man, a global financial centre for wealth planning. The Forgotten Kingdom Exhibition is on display until 9 March 2013 and is open Monday – Saturday, 10am to 5pm at the Manx Museum.